Welcome to my hobbies page. My main hobby is counted cross stitch. I have dabbled a little in quilting, but have waaaay more to learn. I have never put a quilt together, but have had a hand in the quilting (finishing) of one. You can see the one quilt I helped to finish on page two. I hope to learn more about how to quilt. I have so many cross stitch projects planned that I may never learn anything else! LOL I hope to eventually make a page just for the quilts, when I get pics taken of all of them. 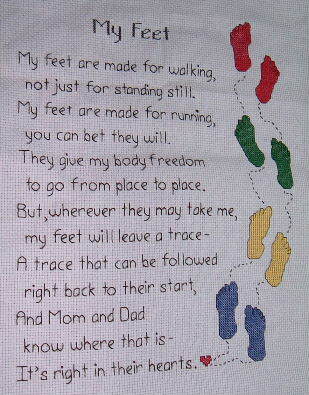 "My Feet" finished June 2006, and companion piece "Handprints" finished May 2006. "1955 Chevy" finished March 2006 for my dad for Father's Day. "Full Moon" freebie, finished Jan. 2006, and "Bible Study" bookmark finished Dec. 2005. 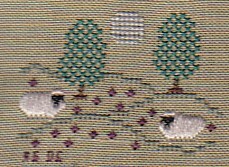 "Country Bloomers", finished March 2005. The Barn. 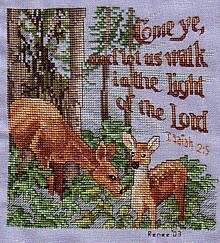 I stitched it and dh painted the frame for me...and "Come Ye" by Leisure Arts--finished July 21, 2003. Stitched on light blue 28 ct. evenweave. Made it into a small pillow. 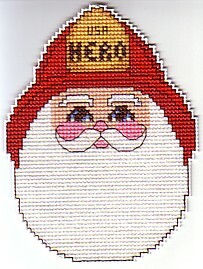 "Santa: American Hero" ornament, finished Nov. 22, 2003. Stitched on perforated plastic...and "Dear Santa, I Can Explain" by Lizzie*Kate--finished Oct. 22, 2002. Stitched on 28 ct. Country Quaker Linen. This was my first experience with beads. This is a Halloween Kitty I stitched on a shirt for my younger ds. Finished Oct. 2002. 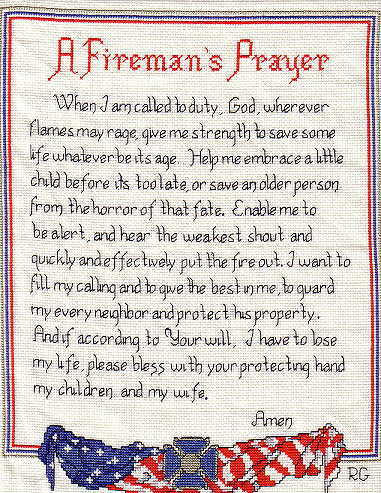 Here is Fireman's Prayer I stitched for my dh, James. He's a volunteer firefighter. I finished this one in June 2002. This is a Lizzie*Kate design I finished 2-22-02. Was fun to stitch and was quick too! It's done on 32 ct. Steel Gray belfast linen.